When I look at my calendar for December, it is jam packed. While I love being busy, I also want to slow down and enjoy the holiday season. I'm really trying to focus on the little things that make Christmastime so special. So, let the countdown to Christmas begin! On Friday evenings for the past several years, my kids have attended Kids Club at a church in our neighborhood. 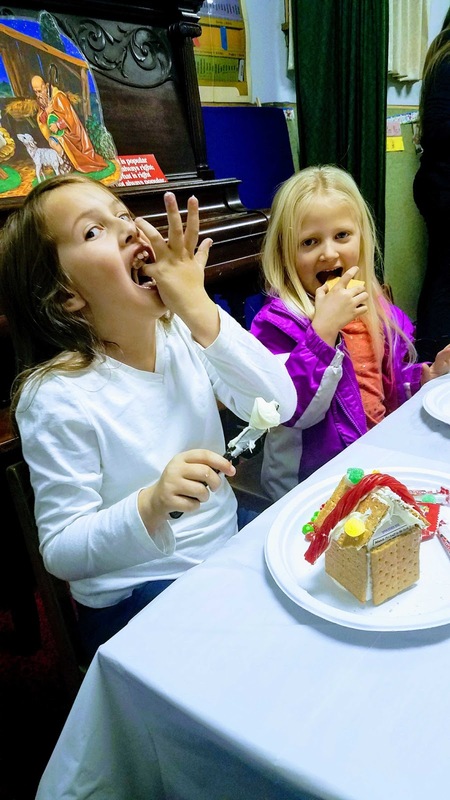 One of their favorite activities is the annual gingerbread house making. Of course, they do more finger licking and snacking on the building materials than actually building, but it is the most fun! Stella came home sticky and super sugared up. Ha! *A little tip for you mommas of little ones that want to do this fun activity: skip the traditional gingerbread house kits and get a small empty milk carton, graham crackers, frosting, and assorted candies. Building on the milk carton makes it easier for little ones to do on their own. Less frustration=more fun!